TruFormOnline – Form. Function. Style. This is a great article by Joey Lee that illustrates a lot of good information about today’s car culture. I hope you enjoy reading it. Since January and February are usually not so busy in the car community, we wanted to let you know that things are, in fact, happening. We are in the planning stages of the Spring Track Day event. This is TruForm. and 417Racing’s 10th Anniversary, so we are planning on some extra things going on this year at the event, including car and bike shows with awards, we’re working on a cash days of sorts, we’re planning on some giveaways, we’re hoping to get a mobile dyno out to the event for people to dynamic their cars on and, if we get lucky, we’ll get some larger attractions as well. That’s staying hush hush for the time being as not to jinx it. We very much hope you can attend the event, which is planned for April 23rd, from 11-4 at Ozark Raceway Park in Rogersville, MO. We are also in the planning stages of our first rally of the year (right now we are planning on 2 of them) in which we will have teams of people driving around finding answers to questions or puzzles and points added to see who the winners are. Afterward we will be finishing in a location where will have a BBQ and hang out, at which time the winners will be tallied, announced and awarded! Stay tuned for details on that. There are some local S2000 gatherings for owners/enthuiasts that are happening the 3rd Tuesday of each month as well in case anyone happens to be interested in those. That information can be found on the Facebook page. Another S2000 owner/enthusiast event that is coming up on March 25th is the Spring Boston Mountain Tour driving event in Russellville, AR. This is one of the best ways to get out and not only enjoy your car, but enjoy the company of like-minded enthusiasts from 16-80 years of age. The first Coffee & Carson event of the season will be April 1st (not kidding), so mark that one down on your calander if you like to get together and see a wide variety of automotive-ness in one place. 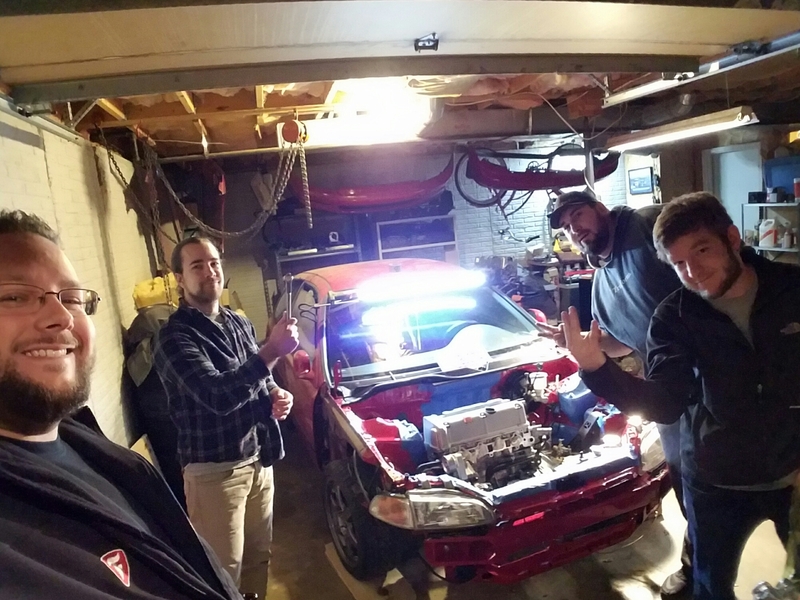 Since winter always seems like a good time to work on projects, we thought it a good idea to share what we’ve been working on in our spare time, and that is the Civic hatchback of one Seth James (prancer). Seth has been working on this car (or not) for the past 5ish years, and, after having removed the B16 it came with, he installed a K24 in it and had some fun for a little while. He then decided that he wanted to do some more modifications to the car that ultimately ended up with the removal of the engine once again, and then something odd happened…Seth forgot he owned the car…or engine…or anything related to it for that matter and it has sat dormant for the past 3yrs. Well we decided to remind him and so we harrassed him and prank called him and left flaming bags of dog poop on his porch to remind him that he has a car to put back together so he could bring it out and share it with the world. SO, after much ado about nothing (you may have seen our live stream on Facebook @ http://www.facebook.com/TruFormOnline/) we wound up reassembling and reinstalling the heart of the little hatch that could right back where it belongs…IN THE ENGINE BAY…SETH! Anywho, we’re hoping to see this little hot tamale running around again post haste. We’d love to see what you’ve been up to, so if you’d like to share pictures or videos of your winter project, then by all means, go to the Facebook page or find the group and share them there. We’d love to hear from you! That’s about all for now, but stay tuned to find out more about upcoming events and happenings in the area! Don’t forget, you can always go to http://www.facebook.com/TruFormOnline/ as well. So with the close of the 2016 year we thought it would be a good time to talk about the fact that this year has been a little slower for us than usual, but there are a number of things we have planned for the 2017 year and we’re excited to see where this goes. We are wanting to get a few driving events together where we can get out and enjoy our cars as well as a few more smaller events and meet ups like we’ve done in the past. We’re looking forward to seeing YOU there and hope sincerely that you’ll be able to make it out for at least some of these events if not all of them. And, as usual, we’re planning on teaming up with 417Racing for the always popular Spring Track Day. Thank you all so much for the love we’ve received from you over the years and we look forward to many more to come! I love me some DC action and Rywire is killing it with this reboot build!!!! Check out these sick builds from WekFest and coverage from Stickydiljoe!! This second part is your all-inclusive look at the Wekfest East event. We take you with us as we go from the set-up phase of the event the day prior to the morning of the show where I give you a closer glimpse at some of the many great cars that attended the show. I did a bulk of my Wekfest video coverage during this time because I had to work the show later that day. As such, you’ll see most of the cars that caught my eye in this piece. I tried to give you guys a detailed look into some of these cars as they were rolling into the venue that morning. Also included are some quick snippets of what we did in Jersey the day before Wekfest took place. Sit back and enjoy the Wekfest East event from a perspective you probably won’t see anywhere else…. 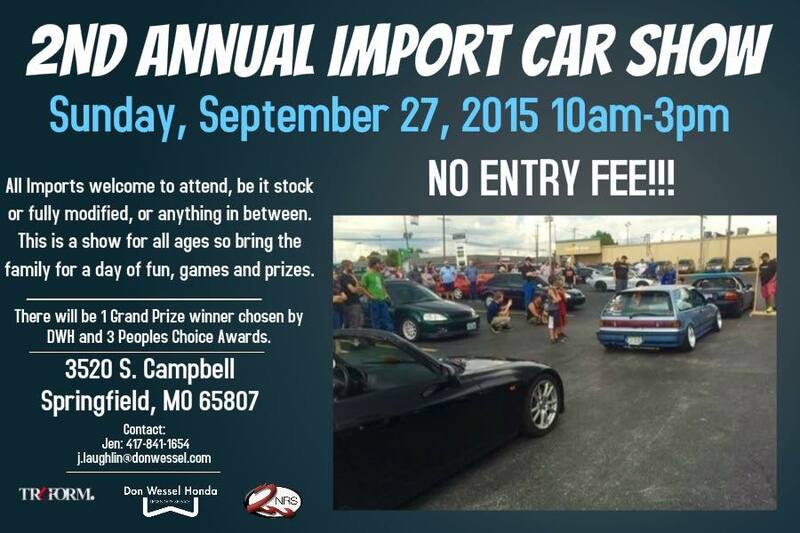 All imports welcome to attend. This is an all ages event, so bring the family for a day of fun, games and prizes.